Christopher Murray is escorted into the courtroom for his arraignment at the Penobscot Judicial Center in Bangor Tuesday. Murray and two others allegedly shot and killed Wayne Lapierre, 59, and wounded his wife, Diem Lapierre, 33, in their Millinocket home in December of 2017. Christopher Murray, right, and his attorney David Bate in the courtroom during Murray’s arraignment at the Penobscot Judicial Center in Bangor Tuesday. Murray and two others allegedly shot and killed Wayne Lapierre, 59, and wounded his wife, Diem Lapierre, 33, in their Millinocket home in December of 2017. Robbery appears to have been the motive for a December home invasion that left a Millinocket man dead and his wife seriously injured, according to an affidavit unsealed Tuesday. Information laid out in the document led to the arrest of Christopher Murray, 38, of Red Springs, North Carolina. 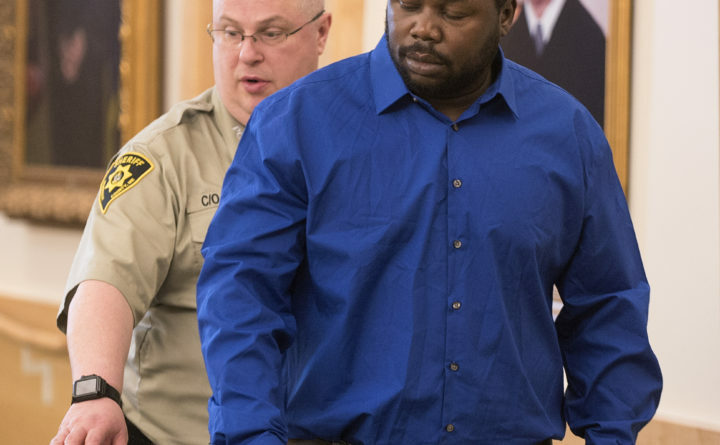 He and Tony Locklear, 43, of East Millinocket and Pembroke, North Carolina, were indicted by the Penobscot County grand jury in February on one count each of intentional or knowing murder, elevated aggravated assault and robbery. 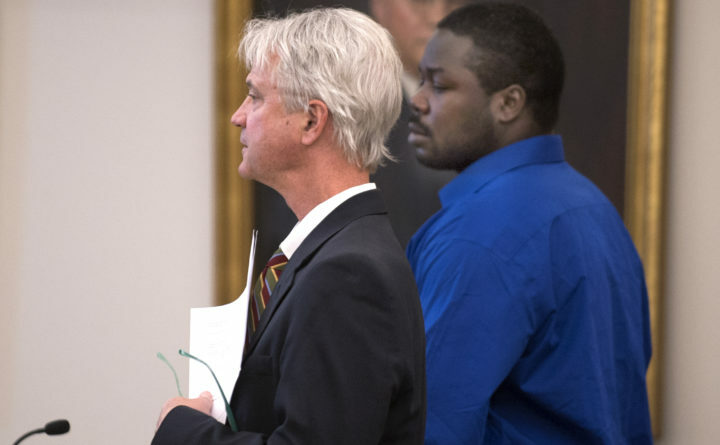 Murray pleaded not guilty to the crimes on Tuesday at the Penobscot Judicial Center in Bangor. Locklear pleaded not guilty to the charges on March 23 after being captured earlier in the month in Alabama. Both men are being held without bail at the Penobscot County Jail. Also charged was Locklear’s 21-year-old daughter, Alexis Locklear of Maxton, North Carolina. She remains jailed in that state refusing to waive extradition to Maine, according to the Maine attorney general’s office. Alexis Locklear was Murray’s girlfriend, the affidavit said. She is charged with felony murder and robbery in connection with the attack. On Dec. 19, the men allegedly shot Wayne Lapierre, 59, and his wife, Diem Lapierre, 33, in their Millinocket home. Wayne Lapierre died of bullet wounds three days later in a Bangor hospital. His wife survived her injuries, according to police. Lapierre was a licensed medical marijuana grower, who also owned storage facilities, a plowing and excavation company and other businesses in the area, the affidavit said. Until Tuesday, the affidavits in the case that led to the trio’s arrest were impounded. Diem Lapierre, who suffered gunshot wounds to the face and head, initially told police who responded to her 911 call at about 7:05 p.m. on Dec. 19 that “they got jumped” by two men wearing masks. She told the officer that her husband was downstairs. The officer found Wayne Lapierre lying on the basement floor with his shoulders against the wall and his hands handcuffed behind his back, the affidavit said. He appeared to have gunshot wounds to his head. A piece of rope was lying on the floor and there was an open safe in the room. The affidavit did not say what, if anything, was in the safe when police arrived. Diem Lapierre told investigators on Dec. 20 that she and her husband were separated, but she was visiting him that night, the affidavit said. She, her mother and her children were living in Bangor and she was traveling to Millinocket once a week to work in the businesses the couple owned together. Wayne Lapierre filed for divorce in August, according to a document filed at the Penobscot Judicial Center. In that Dec. 20 interview with investigators, Diem Lapierre said she recognized Tony Locklear as a former employee, the affidavit said. She said an adult black male and a young female, neither of whom she knew, came into the house with Tony, whose last name she could not recall. Both men were armed with silver-colored handguns, she told police. She said, “Tony took her and Wayne Lapierre to the basement while the young female stayed by the door; that they demanded money and tied their hands and feet with a rope, that they took two diamond rings from her hand and they took $400 to $500 in cash from a wallet,” the affidavit said. Diem Lapierre alleged that the man she did not know shot her in the head. The 29-page affidavit, which was written in support of Murray’s arrest, does not say which man allegedly shot Wayne Lapierre. The affidavit said Joseph Cote, a friend of Tony Locklear’s who lived in East Millinocket, agreed to let Locklear, his daughter and her boyfriend stay at his house if they’d give him a ride to Brewer the next day. They had arrived mid-afternoon on Dec. 19. Cote let Tony Locklear use his cell phone to call Wayne Lapierre about buying some marijuana, the affidavit said. Cote also told police that he gave his friend $25 to buy pot. The three left Cote’s home shortly before 6 p.m. to get the marijuana, the affidavit said. The trio returned to Cote’s at about 7:10 p.m., the affidavit said. Cote told police he left with the three at about 8:10 p.m. in what he believed was Tony Locklear’s PT Cruiser after being told that they had to leave immediately. They stopped at the Irving station in Medway before heading to Brewer, where they dropped off Cote. Because Alexis Locklear used her North Carolina ID to buy tobacco products at the Irving station, police were able to trace her to that state. Police used her Facebook page to learn the identity of Murray and to obtain license information about him from North Carolina, the affidavit said. When police in Maine reached out to the Robeson Sheriff’s Department in North Carolina to confirm Murray’s identity and to locate him, a lieutenant said that he had gone to school with Murray and knew he’d been working at a small casino in the county. In addition to the Maine charges, Tony Locklear has been charged with murder and first-degree kidnapping in the slaying of Braxton Chavis Jr., which took place on Dec. 4 in Maxton, North Carolina, according to North Carolina media. The trio is scheduled to be tried in January 2019. The prosecution has asked that the defendants be tried together. Defense attorneys are expected to ask that the three be tried separately. If convicted of murder, the most serious charge, Locklear and Murray face between 25 years and life in prison. Alexis Locklear faces up to 30 years in prison if convicted of felony murder for her alleged role in the crimes.